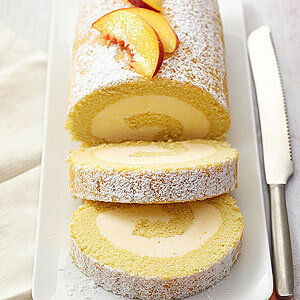 Based on a recipe from the Michigan Peach Sponsors, this cake roll is a flavor chameleon. Swirl in any ice cream you like, and top the cake with any complementary fruit. Let eggs to stand at room temperature for 30 minutes. Meanwhile, grease a 15x10x1-inch baking pan. Line bottom of pan with waxed paper or parchment paper; grease paper. Lightly flour the pan. Set pan aside. In a small bowl, stir together flour, baking powder and salt; set aside. In a large mixing bowl, beat eggs with an electric mixer on high speed for 5 to 7 minutes or until thick and lemon colored. Add granulated sugar, vanilla and, if you like, almond extract. Beat until well combined. Alternately add flour mixture and the water to egg mixture, beating on low speed after each addition just until combined. Spread batter evenly into prepared pan. Bake in 375 degrees oven for 12 to 15 minutes or until top springs back when lightly touched. Immediately loosen edges of cake from pan and turn cake out onto a towel sprinkled heavily with powdered sugar. Remove waxed paper. Roll towel and hot cake into a spiral starting from one short side of the cake. Cool on a wire rack. Unroll cooled cake; remove towel. Spread cake with softened ice cream to within one inch of edges. Roll up cake without towel. Trim ends. Cover and freeze for at least 2 hours or up to 24 hours. Transfer cake roll to a serving platter. Dust with additional powdered sugar. Let stand 10 minutes before serving. Serve topped with peach slices. Cover and freeze remaining cake roll.